Unified heavyweight champion Anthony Joshua insists he is ready, willing and able to face Deontay Wilder, Tyson Fury and Dillian Whyte after defending his IBF, WBA and WBO heavyweight titles against Alexander Povektin at Wembley Stadium in London on Saturday night. Joshua, fighting in his seventh straight world title fight, dropped the Russian veteran in the seventh round and pummelling him into submission along the ropes when he got back to his feet. The time of the stoppage was 1:59. Speaking after the fight, Joshua identified the next three fights he would like to have. 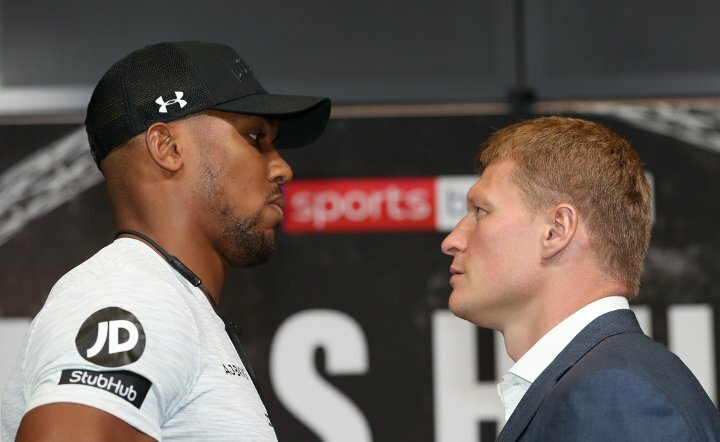 “In order, I’d like Deontay Wilder, Tyson Fury and then Dillian Whyte,” said the 28-year-old Joshua, who joins Wladimir Klitschko as the only other boxer to defeat Povetkin. The comments come hot on the heels of the announcement that lineal heavyweight champion Fury and WBC titleholder Wilder will meet in the United States on December 1, with Los Angeles’ Staples Center believed to be the frontrunner to host the event. Saturday night’s fight was the first of a two-fight deal with Wembley Stadium to host Joshua’s fights. The next date is April 13, 2019. “We really do want to fight Wilder and we will do our utmost to make it happen here at Wembley next April,” insisted Joshua’s promoter Eddie Hearn of Matchroom Boxing. Meanwhile Dillian Whyte was left fuming that he was part of the Sky Sports broadcast team and not at ringside to confront Joshua about a potential clash next year. “I should have been ringside to see him,” said Whyte. The Brixton ‘Body Snatcher’ used his time on the mic to reinforce his credentials and willingness to climb back through the ropes to face Joshua in a rematch of their entertaining British and Commonwealth title scrap of three years ago. “Hopefully it’s me next. I’m here and I’m ready to fight,” he continued, adding: “I don’t know, this boxing is a funny thing. He may need surgery after what happened to his nose.